Why Choose Us For Your Home Inspection? Why choose Preferred Property Inspection Services, Inc. over another inspection company? The inspector's credentials are one aspect that differentiates our company from the rest. Meet the President and lead inspector of the company, Paul Smerz. No need to coordinate a radon test with another company when Paul is licensed to do the testing himself. See indicators of mold during the inspection? 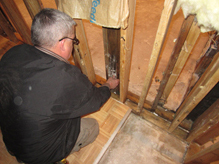 As a certified mold inspector and assessor he can test on the spot. Most importantly perhaps is his background in construction and attention to detail that you find sets him apart. He will take whatever time is necessary to thoroughly inspect your house and report in detail on the findings. You will be very well informed on the fine points of the home you are looking to purchase by the end of the inspection because Paul inspects the home like he would if he were buying it himself. Give him a call, you won't be disappointed. We hired Preferred Property Inspection Services, Inc. to do a safety inspection on our home to check that major systems were operating as intended – like the furnace, roof, sump pump, and smoke detectors. Paul not only checked what was included in the inspection, but also walked around the house with us to tell us of other preventative maintenance issues we should be aware of. We have peace of mind now and will call Paul again next year to be sure our home system's are in good shape!